The DGAM says that the National Museum in Aleppo has received a direct hit by a shell. See the brief here. A short documentary video has been posted by Nour Idriss (6’10”) on damage to Old Aleppo. It cites UNESCO in stating that 30-40% of World Heritage property in Aleppo has been destroyed. The video includes interviews with rebel commanders and dramatic footage of the destruction of the historic Carlton Hotel. See the video here. A photograph shared by Aleppo Archaeology (12 November) shows a dig by a bulldozer in the Western side of Tell Qaramell, Aleppo in two different places, the dimensions 5 * 10 m, destroying archaeological layers and a tomb from the third millennium BC. See here. 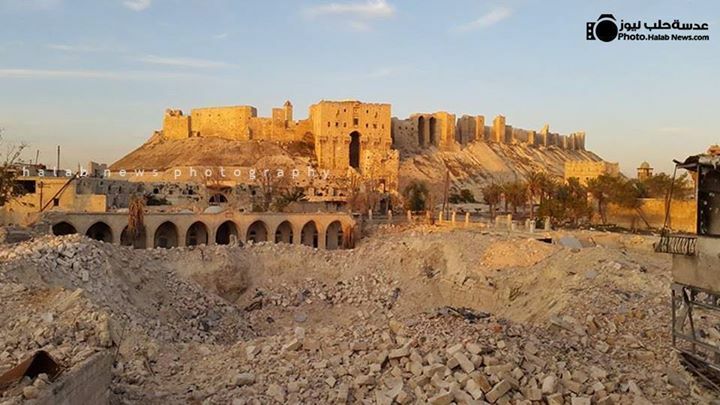 New picture shows the damage around Aleppo Citadel, shared by Aleppo Archaeology, (9 November) here. A view of damage to Bab Al-Hadid, Aleppo was shared by Protect Syrian Archaeology, (4 November) here. 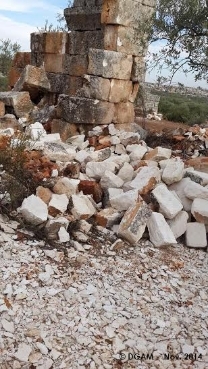 The DGAM reports that the village of al-Bara, one of the best-known of the group of ancient villages which comprise the UNESCO World Heritage Site (Ancient Villages of Northern Syria) is in grave danger. The main threat appears to be damage by bulldozers in order to create usable building material. See the report with photos here. There have been explosions at Samaan castle according to the DGAM. ‘Extremist groups’ have kept people away from the site and have also prevented local people from harvesting the olive crop nearby. For the brief and photo with indicators pointing to the blasted areas, see here. There is an unconfirmed report that an airstrike by the Coalition against ISIS militants on the hill of the medieval castle of Sukkara Jebel ‘Abd el-‘Aziz, Hassakah/ Hassakeh damaged the northern section. The page and photos of the site shared by Protect Syrian Archaeology can be found here. Video shows the damage to the Sarjilla Site, Idlib in Der Serir, taken by Abu Al-Mutanabbi Alatarby, and shared by Protect Syrian Archaeology here. A photograph of damage to the minaret of Alsadaat Mosque in Jobar/Jobbar, Damascus (Lens young Dimashqi, 4 November 2014), was posted here. The Seray (Serail) in Nabik, Damascus has been looted and damaged by fighting, reports the DGAM. See the report and photos here. New digital satellite images reveal damage to the famous site of Mari, in the zone controlled by IS near the Iraqi border. The DGAM says that armed gangs and organised looting are likely responsible. See the image here. 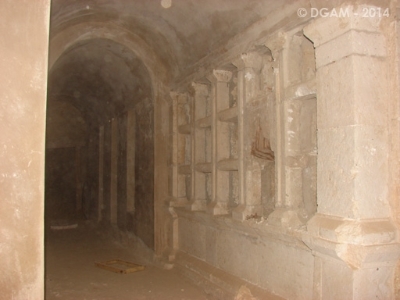 The DGAM reports that the Tomb of Artaban at Palmyra (November 1 2014) was broken into. The tomb, dating from the second half of the first century, contains over fifty burial niches. Despite efforts to protect the tomb by covering it with soil and strengthening the gate, the DGAM says that 22 funerary busts have been stolen. See the report with photos here. DGAM gives a brief report detailing the continued illegal excavations in Deir Ez-Zour. These include Mari, Tell Bassira, Tell Sheikh Hammad, and Qalaat Rahba. The report suggests that looting at Dura Europos has ceased, and that there is as yet no (further?) damage to Zenobia (Halabiye). See the report here. The DGAM reports that the UNESCO training course designed to curb the illegal trafficking of Syria’s cultural heritage began in Beirut on 10 November. The training is aimed at police and customs officers in Syria and adjoining countries and is also carried out with the assistance of INTERPOL. See the report here. DGAM reports attendance of an international conference on the preservation and protection of ancient mosaics. Efforts to preserve the mosaics in the Ummayed mosque in Damascus and other sites were revealed. See the brief here. The German Academic Exchange Service (DAAD) has launched a scholarship program for Syrian students. 7.8 million euros is earmarked to support a hundred Syrian students for a period of study in Germany. Further information can be found on this website www.daad.de/syria or by e-mailing info@daad-gulfregion.org. Trend.az reports on “cultural cleansing” in ‘Islamic State seeking to ‘delete’ entire cultures, UNESCO chief warns in Iraq’ (8 November 2014). The article discusses comments made by Irina Bokova, Director General of UNESCO, and reflect their strategy in Syria as well. The Newsrecord reports on ‘The Detruction of Iraq and Syria’s Treasures’ (4 November 2014) discussing the phenomenon of ‘cultural cleansing’ and the destruction of meaningful intercultural symbols. Saving Antiquities for Everyone (SAFE) reports that its article ‘Heritage Crisis in Syria: A Call for a Moratorium On the Antiquities Trade’ has been syndicated in an Arabic translation in the first issue of ‘Al-Miraat’, an independent Syrian monthly magazine. Al-Miraat’s Facebook page can be found here and SAFE’s original post can be found here (from September 3 2014).